Marissa Gutierrez-Vicario is an educator and community activist engaged in human rights work both within the United States and abroad. This work includes having: investigated human rights abuses and worked on a documentary film in Mexico, conducted human rights research in India, and volunteered for a women’s rights nonprofit in Guatemala. Within the United States, she has planned and organized service-learning trips for youth and young adults, coordinated events for and with youth, and worked with community organizers to address violations of human rights. She also currently serves as a Program Leader for the Unitarian Universalist Service Committee College of Social Justice. 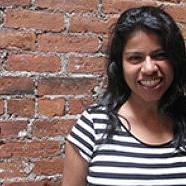 Through her work with Art and Resistance Through Education (ARTE), as Executive Director, Marissa works to engage young people in human rights education through art, design, and technology. As a graduate of the Harvard Graduate School of Education, Marissa has a Master’s degree in Education, focusing on the Arts in Education. She has also received a Master’s degree in Public Administration, focusing on Non-Profit Management and Public Policy from New York University and a Bachelor’s degree in Political Science and International Relations from the University of Southern California.